I’ve come across a question today about what other alternative ways a person can stay healthy. If the idea of being alone and private is what you had in mind on this journey for better health, then I have just the thing that might pique your interest. Read on for my thoughts, one of the many cocoon wellness pod reviews, and judge for yourself about the product. Best Infrared Sauna You Could Ever Ask For! 1 Best Infrared Sauna You Could Ever Ask For! 1.2 What about the negative side effects? 1.3 Can You Use the Cocoon Wellness Pod? 3 Where Do I Get One of These Cool Cocoon Wellness Pods? 4 Should You or Shouldn’t You Get the Cocoon Wellness Pod? What exactly is the Cocoon Wellness Pod? To put it simply, it is an infrared sauna pod that uses a combination of dry heat air system and an infrared heating system that heats up the body from the inside and produces an array of benefits for your health. What exactly is so good about the sauna pod and why is it so sought after? Let me list down a few things as mentioned by Dr. Myers, who is best known for The Autoimmune Solution, and The Thyroid Connection books. A natural way for our bodies to eliminate accumulated toxins is through sweating. Infrared saunas, because of their trademark of heating the bodies from the inside, encourages a more thorough detoxification as compared to traditional Swedish Saunas. Infrared saunas help in balancing your body’s cortisol, the primary stress hormone. That, plus the fact that the heat from the Cocoon Wellness Pod helps relax muscles and relieve stress tension, allowing you to relax more. In an article titled Effect of Sweating, it is stated that an infrared session 30-minutes long could burn 600 calories. The rise in body temperature causes your body to work harder in an attempt to lower your core temperature, making it seem like you actually did some work despite only lying down on an infrared bed. Though this is more common with older adults, the younger crowd is also prone to this, so you have to remember to hydrate properly before using an infrared sauna. Because infrared saunas don’t heat up as much as the traditional saunas, staying too long under one may cause you to overheat. This is definitely not for people with particular ailments and even for others with implants. When in doubt if you can use it due to a prior illness, always consult a physician. Can You Use the Cocoon Wellness Pod? It is important to note that though there are health benefits with using infrared saunas, you must take into account your present condition before diving in— or should I say snuggling in— the Cocoon Wellness Pod. Pregnancy, as well as having a heart condition, are red flags in the infrared sauna department. Otherwise, if you are healthy, in the prime of your life, stressed and have aching joints and protesting muscles, jump right in for some relaxation time. Lets you choose your preferred body temperature, giving you maximum comfort and results. The infrared sauna’s dual heat system warms the body while the dry heat brings relief from stress and tension. Raises the core body temperature with a deep warmth that may last 4-12 hours after your session. The air inside the pod is gradually heated in a safe, even rise that you can personally adjust. This massage feature can be adjusted in intensity. 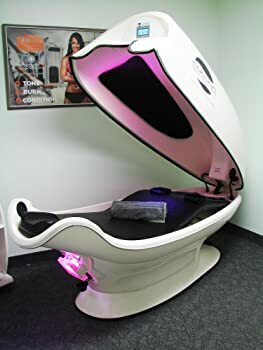 A full body immersion that includes a foot massager. This, combined with the dry heat of the Cocoon Wellness Pod, makes for an ideal stress reliever. A built-in exercise fitness system that can easily be changed to provide resistance that ranges from low to high for all levels. It maximizes the burning of calories rather than weight management. This allows you to adjust the cool air flow that is directed to your face and neck for optimum comfort during the heat sessions. Depending on the user, the Cocoon Pod has a feature that allows for you to add or omit essential oils during your session. “One half hour session raised my heart rate from 81 BPM to 172 BPM…all I had to do was lay there while being massaged in a cocoon of warmth listening to spa music. Seems a better way to get some cardio…” – The Sun Emporium. “One 40-minute session and I’m already a fangirl of infrared sauna pods. I am a sauna pod junkie.” – Alina Gonzales from Byrdie. “This would be great for anyone who wants a quick way to relax, relieve pain, or muscle tension.” – Amber from Native in Nashville, Life+Style Blog. Where Do I Get One of These Cool Cocoon Wellness Pods? With all these benefits, you might wonder where you can get your hands on this beauty. Surprisingly, you can actually find a listing of this product in popular online retailer sites. Most common delivery time is 2-4 days, but that’s highly dependent on where you are. As to how to use this infrared sauna, it’s essentially ‘plug-and-play,’ with no added worry of plumbing or configuration. Best part? You only need small floor space for the setup. Should You or Shouldn’t You Get the Cocoon Wellness Pod? 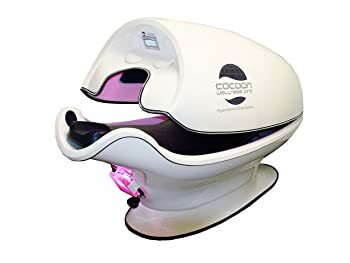 I think getting a Cocoon Wellness Pod for yourself is a good investment provided you have no illness that would counter the use of the product. I tried, but I couldn’t find any bad review for this product. It’s not a jade sauna, but, personally, I think it’s better. The infrared sauna fad is growing fast. That’s one reason to find a spa near you to have a hop inside a Cocoon Wellness Pod and see for yourself the truth behind the cocoon wellness pod reviews. I’m sure that after a session, you’ll definitely want one in the comfort of your own home.